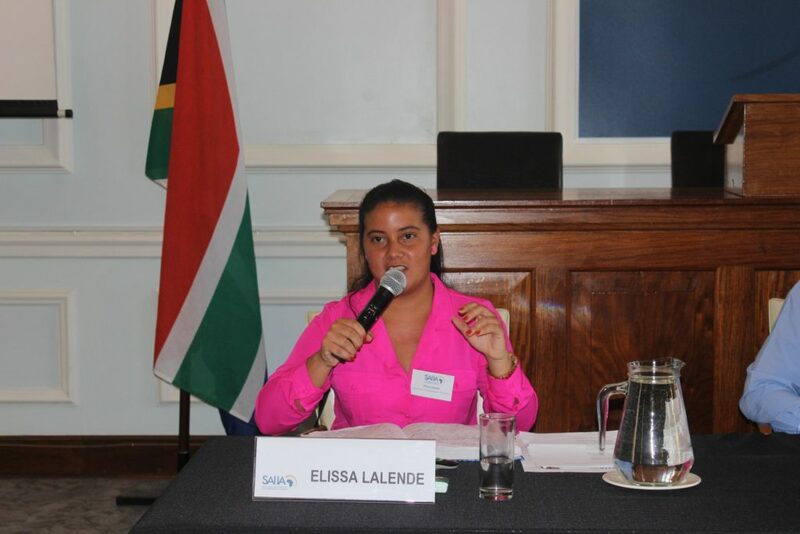 Elissa Lalande, Senior Policy Analyst, Ministry of Environment, Energy & Climate Change, explains the country position of Seychelles on marine & coastal EbA – a country dependent on its rich ocean resources (Source: SAIIA). On the 24th January 2019, the South African Institute of International Affairs (SAIIA) hosted the ‘Policy Conference on Marine and Coastal Ecosystem-based Adaptation (EbA) in Southern Africa’ at the SAIIA head offices at Wits University, Johannesburg, in order to facilitate peer learning and policy engagement around this theme. Ecosystem-based adaptation (EbA) supports the sustainable management, conservation, and restoration of ecosystems, which in turn provide services that enable communities to adapt to climate change. The conference sought to strengthen the Southern African region’s climate resilience by sharing knowledge on the adoption of EbA approaches, specifically as it relates to coastal and marine environments. A focus was on how to tap into marine and coastal resources, while at the same time ensuring the sustainability of these resources – as well as how EbA practices can enhance equitable access for local communities dependent on such resources. The project is therefore also relevant for the region’s increasing focus on promoting a sustainable Blue Economy. Focus countries include South Africa, Mozambique, Tanzania and Seychelles as case studies to inform national and regional engagement on EbA responses. The conference began with a panel discussion around regional perspectives on EbA in marine and coastal environments, with high-level representation from the Indian Ocean Rim Association, UNECA, UN Environment and the AUC speaking on flagship African programmes, policies and conventions that feed into COP decisions, support delivery of the Sustainable Development Goals (SDGs), and enhance the regulatory environment of ocean governance for the 38 coastal countries in Africa. This was followed by a panel discussion showcasing how the four case study countries (Mozambique, Tanzania, Seychelles and South Africa) approach EbA differently. While an understanding of the different policies and country positions on the Blue Economy and how EbA practices are being implemented was explained, the emphasis was on similarities between countries and what has been successful in practice. Links were made with the huge economic spin-offs of successful EbA projects; for example, where Tourism, closely reliant on the health of the environment to add value, becomes a sustainable source of payments for ecosystem services – found to be up to ten times higher than that of fisheries. Technical expertise, engagement with communities and community ownership, education and capacity building were pointed out as being critical pillars to the success stories of EbA projects in these four case study countries. Following this, the appointed country researchers of the project presented findings related to specific case studies – drawing on the socio-economic circumstances of coastal communities most reliant on ocean resources to highlight not only how such resources could be depleted, worsening climate vulnerability, but on how EbA responses empower and uplift these communities. At the same time, the case studies demonstrated the benefit of conserving the resource base through improved governance and community-ownership, which in turn has huge economic advantages – such as the preservation of mangroves for protection against ocean swell and action, or reef recovery which allows fish and octopus stocks to replenish as food and trade sources. • What does ‘value-for-money’ mean in the implementation of an EbA project? • How can EbA projects best be justified in financial terms (for example, through cost-benefit analysis)? • How can social capital gains from successful EbA projects be quantified? • How best can EbA projects be financially structured such that community ownership and the success of the project is guaranteed? A robust and interactive conversation followed, with inputs from many of the experts in the room – with a crucial conclusion: buy-in and trust underpin every successful EbA project and are critical to the longevity of marine and coastal resource management. The day’s proceedings were closed with a final synthesis discussion. Delegates left with a profound glimpse into how regional collaboration and knowledge sharing can catapult efforts towards greater climate resilience, improved livelihoods and better governance from national to local scale. This entry was tagged benefits, climate change, co-benefits, coastal, community, eba, ecosystem-based adaptation, Marine, mozambique, oceans, policy, SAIIA, SANBI, SDG, seychelles, south africa, sustainable, tanzania, tourism. Bookmark the permalink.